oikos » Blog Archive » Will You Buy my Sustainable Finance Research? oikos › News › Will You Buy my Sustainable Finance Research? Will You Buy my Sustainable Finance Research? In the past decade, corporate fraud, bank scandals and financial crises have taken their toll on society’s trust in the global financial system. The recent events have established the need for substantial changes in the way we think and act in order to create a more sustainable and long-term oriented business environment that ultimately benefits us all. Such advancements can be driven by incorporating environmental, social and governance factors into the investing and decision-making process of individuals as well as institutions. In order to convince these individuals and institutions of the benefits of sustainable finance, we need to sell our research in a clear and credible manner. 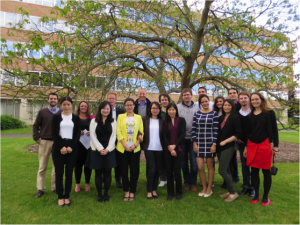 In the first week of June, fifteen Ph.D. and post doctoral students from around the globe got together at the University of Reading to discuss a wide range of topics on responsible investing during the oikos PRI Young Scholars Finance Academy. 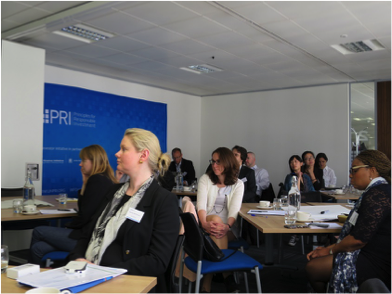 The academy was hosted by the Henley Business School and co-organized by oikos, the UN-backed Principles for Responsible Investing (PRI) and the Henley Centre for Governance, Accountability and Responsible Investing (GARI). 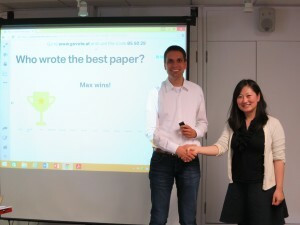 The main program comprised individual research presentations, paper discussions, and several comprehensive workshops by the faculty members – George Serafeim, Bert Scholtens, and our host Jill Atkins. The atmosphere at the academy was fantastic and stimulated many profound discussions. George Serafeim provided great insight into various aspects of the research process using relevant examples from his own renowned work in the field of sustainable finance. He stressed the importance of catching the academic readers’ attention by building credibility and telling an intriguing story. Bert Scholtens highlighted essential practical research skills and encouraged the group to reflect on their individual circumstances by posing relevant and sometimes provocative questions. Jill Atkins revealed challenges in the publishing process and shared her personal experiences with us. She also introduced us to some fascinating alternative sides of sustainable finance that she is active in – such as accounting for rhinos, or the business of bees. The faculty members were very engaged, providing valuable comments and support throughout the event. The research presentations by the participants ranged from the transmission of social values, through carbon disclosures and emissions, to governance and shareholder engagement. Despite the variety of research focuses, all participants were actively involved, providing critical comments and suggestions to their peers to encourage the development of each other’s work. These discussions were often carried on in the evenings over dinner and drinks. On the last day, we travelled to the PRI headquarter in London where we had the opportunity to exchange ideas and discuss our research with practitioners from the field of sustainable finance. Gaining a sneak-peak into the practical challenges and views of the practitioners was an insightful experience. The academic program was complemented by fun social activities. We went on an excursion to the gorgeous little town of Henley, where we visited the rowing museum followed by a scenic boat trip down the river to the majestic Henley Business School. After a great day of discussions, it was the perfect way to wind down and to better get to know each other. The academy turned out to be a great learning experience and I am convinced that all participants left the academy enriched with new ideas, constructive feedback on their work, improved research skills, and a new network of friends.